Sounds like DSA is quickly devolving into being 25,000 chunks of juicy reformist-liberal carrion being torn to bits by competing bloodthirsty Trotskyite and Leninist vultures. I have to say, for a long time I thought what the f*ck are anarchists/communists doing within thy DSA. But it does seem to be a pole of attraction for the newly radicalized in The US and I think there's value in putting forward a clear class struggle line with that grouping. I have no idea if this is the group/statement to do that, but I do see the value in making those arguments and engaging with the wider organisation. Chilli, politics is either hopelessly reformist; or cynically manipulative. You can't talk to people with different opinions! I dunno. I'm still sticking with the SDS comparision for DSA. Very similar demographics. Very similar places where they are large, but also almost as spread out, too. In fact, for some places that now have DSA chapters with several dozen members, SDS may have been the last radical left organization that existed that had that many members. The somewhat decentralized structure is similar, too. As I understand it, the national committee or whatever it is called, doesn't have much power over the local level groups and whatever staff they have that service the locals, is somewhat disorganized and not done great. The big difference between SDS and DSA though is that SDS actually did things and developed before the proliferation of factions and caucuses. DSA hasn't really had that oppurtunity. Where people joined SDS for what it was, people are joining DSA for what it might be. How is DSA relevant all of a sudden, when historically it has endorsed Walter Mondale, Jesse Jackson, Ralph Nader, John Kerry, Barack Obama, and Bernie Sanders for the U.S. presidency? Why not the 50 year old Peace and Freedom Party with its origins connected to the Panthers? Or the Greens, who's fundis in the mid-1980s supported an "anti-party party" anti-electoral position? Or the legacy of the Labor Party Tony Mazzocchi helped found in mid-1990s? In my opinion all of those were destined for failure since they fetishize the Left-Leninist orthodoxy of building the organization first, emphasizing form over content. I remained unconvinced the DSA, which politically is to the right of all of the above groupings, is any different. Yet I remain agnostic and am open to being convinced otherwise. Despite the rhetoric, how can DSA contribute to class struggle? And how can anti-authoritarians coexist in organizations manipulated by parliamentary maneuverings, which inevitably happens when opportunistic Leninists and Trots -- especially the worst of the bunch, the ISO -- jockey to take over? I find the Communist Caucus intersting because "some of the founding members" are influenced by Bordiga and "early" Camatte. Not adhering to the Leninist vanguard model would be a good sign. Does this group still exist? Have they actually done anything? What is a "Leninist vanguard model"? The concept of a vanguard is something that was spoken of in the manifesto as well, it's not something that Lenin came up with out of nowhere. If you mean what Lenin talked about in What is to be Done?, then I'd say that you are taking it out of it's historic context and it's not something any "Leninist vanguard model" outside of that context would apply. Further more, have you read Camatte's texts like On Organisation or Origin and Function of the Party? You realise this is libcom don't you? Judging by Lenin peeking into your profile pic, maybe not. Many libcoms are not in favour of parties let alone vanguard parties irrespective of what Marx or the renegade Lenin said over a century ago. I don't expect everyone, or even most, to agree with me of course. But that wasn't my point, my point was that you are just throwing around random evil sounding buzzwords like "Leninist vanguard model". It literally just acts like a pat on the back from your libcom friends and as quizzical look from anyone who has read Marx or Lenin. I mean seriously, I don't care about downvotes or disagreement but every time two or more people disagree with me someone says something along the lines of "you know most libcoms wouldn't agree with you right?". In my opinion all of those were destined for failure since they fetishize the Left-Leninist orthodoxy of building the organization first, emphasizing form over content. I remained unconvinced the DSA, which politically is to the right of all of the above groupings, is any different. Yet I remain agnostic and am open to being convinced otherwise. So I don't see the difference either, but in terms of relevance to this site, a lot of (in the main newly politicised) US people (maybe as much as 20,000?) have joined the DSA in the past year or two. This is a similar trend to the tens of thousands who joined the Labour Party and Momentum in the UK. Although they are structurally and politically quite different groups, but it's been the default organisation that people have joined in the same way, and the fact that various types of anarchist/trotskyist/leninist and non-aligned people have joined both groups is a common theme. I think this is significant enough that it's relevant to publish/discuss critical stuff produced internally to those groups, as well as content critical of the organisations from a communist perspective - including on the limits of entryism etc. Another way to put it - we can have a very low opinion of the organisation and its possibilities, but the organisation and the thousands of individuals in it aren't the same thing. A Leninist vanguard model is one where important decisions are taken by a minority of 'important' members, reflecting the way they rule society if they take power. Not necessarily restricting an open party press or factions. It is, of course, quite legitimate to say that the socialist party represents the true interest of the working class; Marx had said the party represents "the most advanced and resolute section of the working class". Such a statement is a tautology as long as the mass of workers accept capitalism. But Lenin went much further than this. In his State and Revolution, written during 1917, he declared that the Party must seize power by force and hold on even in the face of resistance from the workers it claims to represent. In other words, "dictatorship of the proletariat" meant little more than the dictatorship of the Bolshevik Party. There were plenty of twentieth century groups that continued a 'what is to be done' model outside the context of illegal groups in Tsarist Russia. It applies to most of the British Trotskyist groups for a start - full time cadre, unaccountable leadership etc. with horrible results. So when people react to this, it is sometimes 'big A anarchism' in the sense of not having read Marx or Lenin or only having read it in the most hostile possible way, but it can also be a reaction to lived experiences of Trotskyist and/or Marxist-Leninist groups. Either on the outside watching the antics of Socialist Alternative, ISO, WRP, SWP, RCP or whatever, or people may be ex-members of those organisations. Also a lot of people in those groups haven't read much Marx either, they can be pretty shoddy for political education and encourage people to read interlocutors. The impression I get from the statement though is it's located in the workers enquiry tradition, which started with Johnson-Forest (Grace Lee Boggs, Dunayevska, CLR James, Glaberman) and then the more recent communization stuff (although they haven't talked about this at all yet afaik, so it's mostly supposition). Those are interesting groups that didn't necessarily break with Lenin in all cases (see https://libcom.org/library/silences-suppression-workers-self-emancipation-historical-problems-clr-jamess-interpreta) but yet can't really be described as 'Leninist' either. The "spontaneous struggle" is Leninist vanguard terminology. It is used to counterpose with struggle directed or agitated by the party, in other words, orders from above - something the road to socialism will need to reject as many in the First International did. All major parties have some mass support and most governments and of course Lenin would claim the Bolsheviks had mass support wouldn't he? Seriously, your entire argument seems to boil down to that when Lenin said "bad things" he meant what he said but when he said "good things" it was an evil trick and he actually meant more "bad things". Or is it that the masses of organised workers are legitimately protesting and inevitably showing readiness to throw out the new officials who refuse to rectify the useless and harmful excesses of bureaucracy? - workers had genuine grievances against the bureaucracy, after a four year process of the Bolsheviks subsuming workers' organisations into the state. - the Bolsheviks in four years had not made significant changes to the Tsarist state "It has only been slightly touched up on the surface". Although the one exception he holds up looks to be just an advisory group if anything and not any example of real self-management. You don't need to think he was good or bad to recognise that he admitted these failings - although of course we can also point to him expelling Miasnikov from the party around the same time for making similar (but stronger) criticisms. I do think that criticism of Lenin is strongest when it avoids conspiracy/betrayal and just focuses on his actual politics and behaviour. https://libcom.org/library/renegade-kautsky-disciple-lenin-dauve is an example of this. think that is a too specific definition, it is struggle that happens outside of any form of formal organisation, that includes unions. It's not just outside though. A lot of the biggest wildcat strikes were by workers organised in formal unions, who struck despite/against the formal organisations they were a part of (and sometimes with tacit or explicit support from shop-floor union representatives, but not always). Informal work groups, strike committees and other forms may look spontaneous but they aren't necessarily. I think you seriously underestimate those that did not support the Bolsheviks. While a vanguard is a minority of the class, it can have "mass support" and this is what Lenin claimed for the Bolsheviks. This sort of "mass support" is however not the consciousness required for socialism. The DSA should reject the Leninist vanguard as it is a barrier to socialist understanding including as evidenced by Lenins first actions in power. Lenin is certainly regarded as the pioneer of fake news (Pravda) and post truth political campaigning demonstrated most ably by the trump campaign. 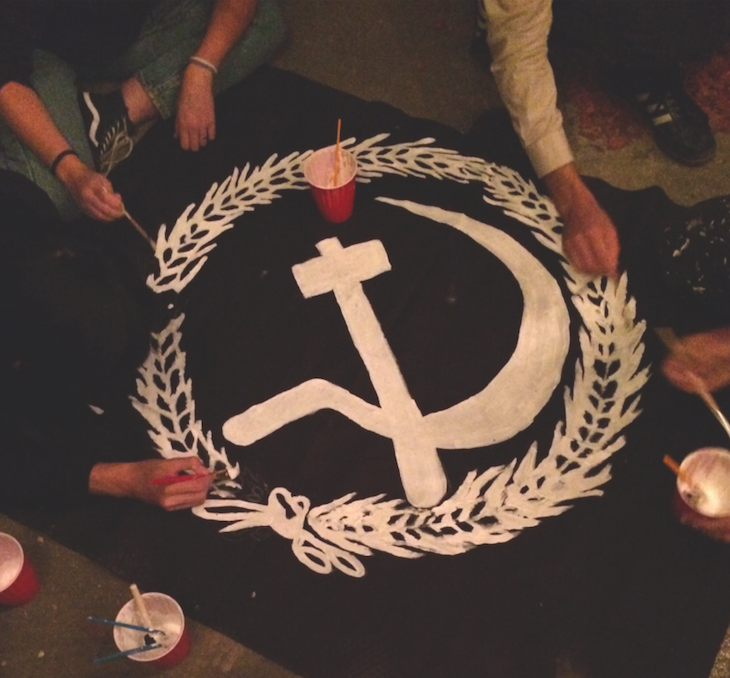 So does anyone know if the 'DSA Communist Caucus' has done, or is doing, anything useful outside of arguing positions or strategy within the DSA itself? Northern California. We are experimenting with what we’ve been calling tenant councils. The idea is to organize tenants in ways that allow them to directly confront their landlords, who, for tenants, personify capital. This is a departure from other tenant organizing that focuses on building electoral pressure sufficient for policy change at the municipal and state levels. We have successfully organized one tenant’s council in the Bay Area. The landlord in question has a holding of over 40 apartment buildings. We have been working on getting the tenants in these buildings to self-organize, and to push the landlord on various issues. They also get a positive mention here: theleftwind.wordpress.com/2018/03/02/so-what-do-we-do/ - although I can't quite work out if the authors of that piece being enthusiastic about them is a negative thing or not.